Rumen Bachev and Stefan Piperov, early Bulgarian participants at 1st IYPT (1988) and 2nd IYPT (1989), unveil details and shed much light on the events. Remaining still unclear is the status of the 1st IYPT, and if a formal international ranking has been announced in early April 1988. 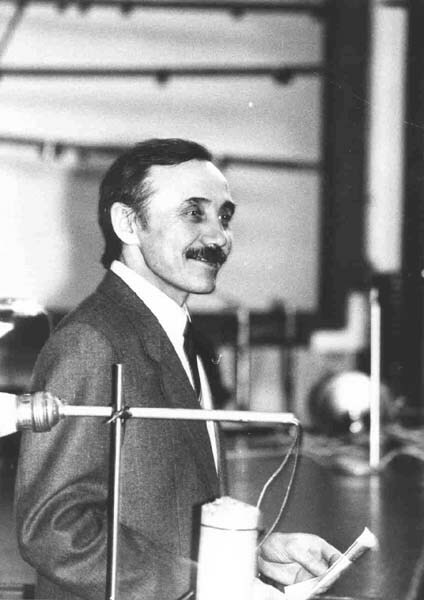 Rumen Bachev (b. 1971 in Sofia, Bulgaria) graduated in 1994 from Sofia University and earned his PhD from the Institute of Astronomy in Sofia in 2003. He works currently at the University of Alabama and at the Institute of Astronomy, Bulgarian Academy of Sciences. Stefan Piperov (b. ca. 1971) graduated in 1995 from Sofia University and got a PhD in High Energy Physics from Humboldt University, Germany. He now works between Fermilab, CERN, and the Institute for Nuclear Research and Nuclear Energy, Bulgarian Academy of Sciences. I. M. A recently traced paper in Gift. Tal. Int’l gives your names as a Bulgarian participants in 1989, winning gold at the competition. R. B. Indeed, I participated in the Young Physicists Tournament some 20 years ago! Actually I was a part of the Bulgarian team twice – in 1988 and 1989 (can’t be sure for the months). The second time we indeed won a gold medal, together with another foreign team (forgot which one). So, it will be a pleasure to answer your questions, as long as I can remember the details. I. M. It is fantastic that you were participants in 1988, because while some details are known for 1989, the 1988 still looks very obscure. Did you possibly preserve problems, notes, diplomas or photographs from the 1988 and 1989 events? R. B. Yes, I believe I did. Let see when I return back home. Photographs I keep for sure. S. P. Unfortunately I do not have any photos of the events, but my classmates and friends from the team surely keep some still. I’ll ask them. 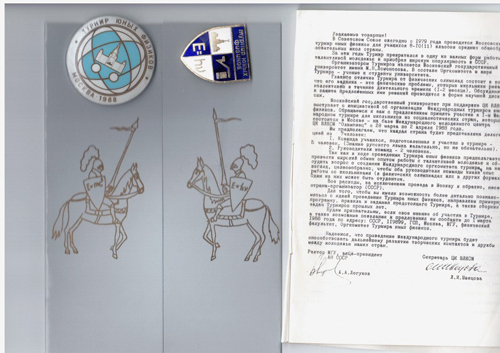 I. M. Could you suggest if you remember on your diplomas or elsewhere the IYPT logo with horses and knights? I am checking when the logo was re-drawn into the version that it commonly used today. R. B. I remember the logo and think it was present since the beginning (1988). But will double check. I. M. Were you preparing any visual aids for your reports, like paper posters or transparencies, in 1988 and 1989? R. B. I guess there were posters (not transparencies) but can’t be positive. I. M. According to your impressions, most reports at the YPT were theoretical or there were many teams performing good experiments? R. B.There were both but don’t remember many details. S. P. In 1988 there was no formal competition in Bulgaria. It was only our team formed – for a very first time – in our “very special” high school, that participated straight into the finals in Moscow. There, we were not part of the “official” ranking, since we did not participate in the earlier – National – rounds. Nevertheless we played against the other team as equals. Just were rakned separately. If memory serves me right, we were the winners of the “international” part of the competition. There was an official winner of the “regular” competition, which was from a Moscow school, I believe, but I do not remember the name. .. perhaps somebody else. I can’t be sure, though, which year the other guys attended the Tournament. Two other people were with us – our physics teacher Liudmil Vasilev and another “Komsomol” guy – Jan Videnov, who later became a prime minister of Bulgaria for some time. 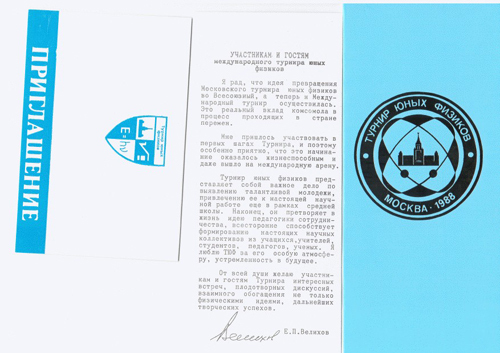 In 1988, I believe, we – perhaps as foreign guests – were not officially graded, so an USSR team must had been be the winner. I. M. The experience of your team is extremely interesting. When you first heard of the IYPT, and how did your team organize preparation? R. B. Can’t say for sure. In the school perhaps. We were studying in a high-level physics and math-oriented high school, so the first year they just picked up some people from our physics class. During the second year there was, however, a competition between several schools. We won and attended again. I. M. Were you speaking Russian or English at the competition? R. B. Russian. Some of the other foreign teams (Hungary, Austria, I believe) had interpreters. I. M. What problem did your team report at the Finals, if you have participated at any? R. B. I can’t be sure. When I check what I preserved I might have some more clear ideas about the problems. 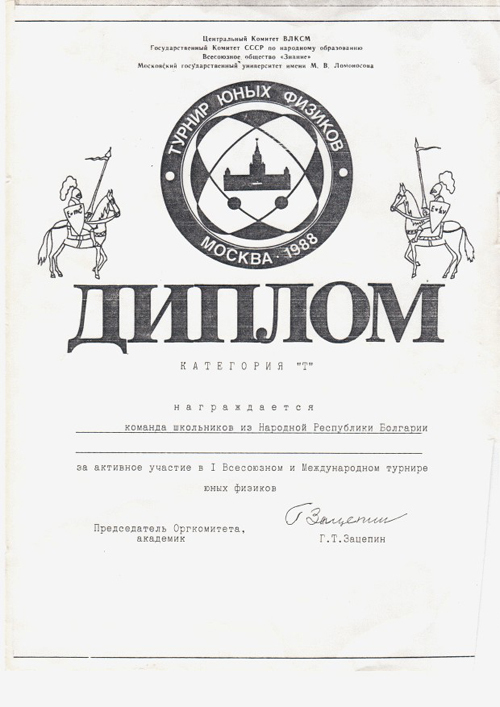 I. M. There is a brochure published in 1996 which says (page 9) that in 1988 the gold winner was “USSR”, the silver winner was “USSR-Latvia”, while Bulgaria and Czechoslovakia won bronze. R. B. This for sure is not correct, as long as our team is concerned. We did not participate in the final grading and won no medals. I. M. This source also says that in 1988 there were 4 teams from 3 countries. R. B. As I recall there indeed were only a few international teams (probably 2) and many other USSR teams. I. M. I found and contacted two years ago with Yury Yufryakov, who represented a team from Moscow School 542 and (plausibly) was a winner among Soviet teams in 1988. By that time I was still unaware of the Czech paper and only had some late hearsay accounts. Yury is strongly convinsed that there was no international competition at all, and meetings with non-Soviet teams were like “friendly sessions”. Despite that, there were some accounts which claimed that Yury’s team was “a gold winner in 1988″, which Yury strongly disagrees with. R. B. I fully agree with him. I. M. I need to explain why I dig that much into details of 1988. There were many articles published in late 1990s where information on 1988-1992 appeared questionable and unreliable. For example, there are sources claiming that the winners in 1988 were Poland and Soviet Union. R. B. Again, that is not correct. There might have been competition between the Soviet teams, but no international team participated in the grading. I. M. Andrzej Nadolny (Polish teamleader in 1989) convinced me that there was no Polish team at all in 1988. R. B. I would also say so, but can’t be positive. R. B. Quite possible. I remember we were not the only foreign team at that time, but there were very few, perhaps two. Can’t be positive about Czechs though. I. M. Can you confirm that the problems published in Kvant in August 1987 were in fact what you were discussing at the event? S. P. Going through the excellent compilation of links that you’ve sent, I can say that I fully recognize the set of Problems for 1988. I remember very well our team building the “vechpriemnik” in two versions: one that used solar power and a tiny piezzo-speaker driven by an ingenuitive FM-radio, and another powered by a hand-crank generator. Also – the rest of the problems I recall pretty well. I myself worked extensively on the 4-color TV (problem #8), and Nikolay Nikolov made several excellent early-morning photos of the Sun for the Sunset Problem (#7). 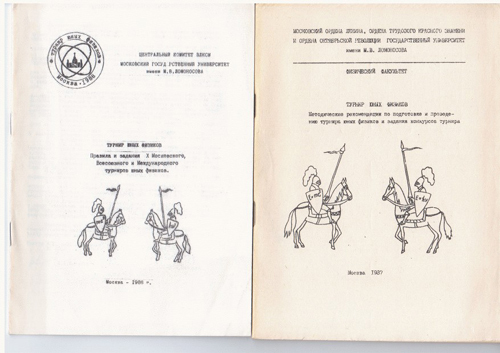 I. M. Do you know if any articles on Bulgarian participation were published in Bulgarian journals? R. B. Not that I know of. I. M. Can you suggest that in 1988 and/or in 1989 your team played together with more-than-few Soviet teams throughout all selective stages? For 1989, the paper in Kvant suggests that possibly there was a pre-selection among Soviet teams before they could join “international” rounds and play with your team. For 1988, it is not very clear. R. B. Can’t be positive, but we probably participated throughout the selective stages. However a pre-selection among the Soviet teams might have existed. I. M. I contacted in September 2009 with Igor Nosov, who represented a team from Ashgabat. He recalls playing and discussing incandenscent bulbs with a Bulgarian team just at the selective fights. R. B. This I remember for sure, we had to compete with someone on this problem. I. M. Would it be possible to kindly ask you to have a look on the interview with Yury Yufryakov to detect mistakes or inaccuracies? Do you possibly remember opposing or reviewing his computer-aided report on the Ninth Wave? R. B. He is very specific and shares many details that I can’t recall much about. No, I have no memories on the 9-th wave problem competition even if I believe was the one to work mostly on this problem. S. P. Going through the photos on your page, I can certainly recognize this person. He was one of the organizers, wasn’t he? Unfortunately I cannot recall his name. I. M. Yes, his name is Evgeny Yunosov and he was the key organizer of the event, often credited as also the author of the IYPT concept. 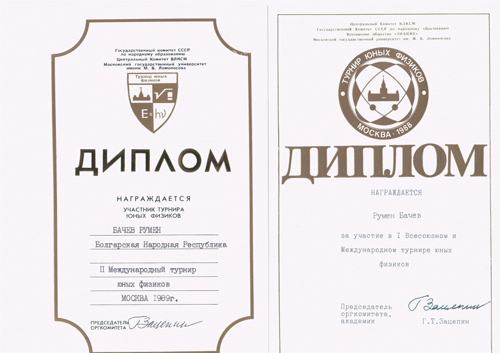 S. P. In 1989, there was a National round in Bulgaria, which our team – only slightly modified from the year before – won, and then went to the Finals in Moscow, where we won the gold. I. M. Concerning the 1989, there is a detailed paper on 1989, confirming that you won gold together with the German team. R. B. It is quite possible the second team was the german one. I. M. The problems for 1989 were published in August 1988, and even translated into English for (at least) the Dutch team, as Hans Jordens informed me. However, there is now some evidence that the problems were changed in the very last moment, with 9 tasks fully replaced. Do you recollect the problems and could you comment on this point? R. B. I must have at home the original problems that we had to prepare in advance. If I recall correctly at some point we were told that we shouldn’t prepare all the problems but only a part of them. In any case not all the problems from the journal look familiar to me, but all of those I remember are there. Except for one, perhaps, about the highest altitude a mosquito can fly. S. P. The problems from 1989 also [as for 1988] seem very familiar – from beginning to end. we prepared for. I do not see any discrepancies. S. P. I will gladly answer your further questions, if you have any, since the Tournament still holds a special place in my heart, so many years later! I. M. Many thanks for your very detailed and helpful answers! Your corrections and commentaries are among very few first-hand sources on 1988 that we have. The brochure scanned by Rumen is great (there are detailed regulations, description etc., all we have never saw before)! The interview with Rumen Bachev was primarily taken on March 19-20, 2010. The interview with Stefan Piperov was primarily taken on April 10-12, 2010. Updates, fact checking, and document scanning by Rumen Bachev, were completed between October 6 and October 25, 2010.